It is important to have a light dessert that can be brought out at short notice and served on a day when dinner preparation time is at a minimum or guests have not been expected. 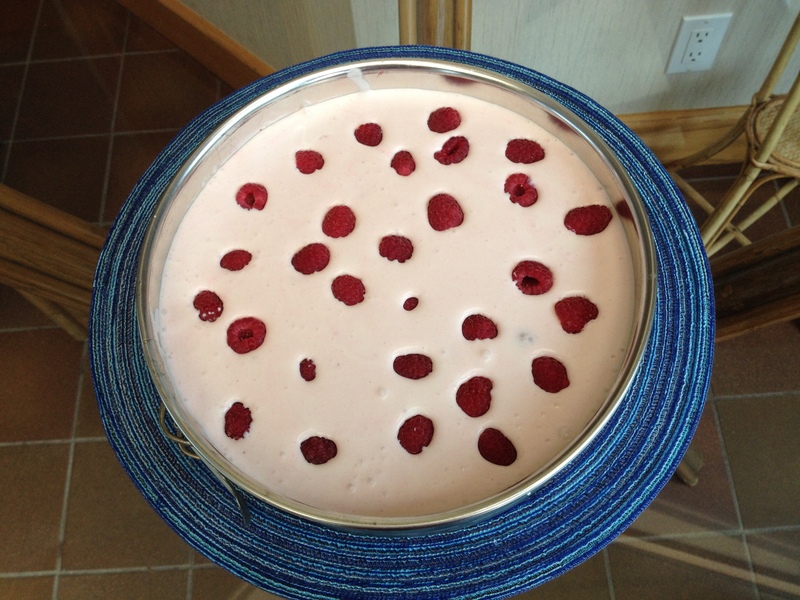 I adapted this recipe from one that featured a ‘brand name’ frozen raspberry juice, although these days the best I could find was a frozen juice labelled as ‘berry.’The gelatin keeps the dessert firm when it is thawed and addition of fresh raspberries exaggerates the natural flavours. 1. Place wafer crumbs in bowl, blend in melted butter. Spread on the bottom and up sides of 10 inch (25 cm) spring form pan. Pat firmly into place, place in freezer as you prepare cheesecake filling. 2. Assemble remaining ingredients before beginning. 3. Mix part of sugar with gelatin in a small glass bowl or measure. Add half of raspberry juice concentrate. Beat in egg yolk. Heat in microwave until gelatin is fully dissolved. Add remainder of raspberry juice. Place in refrigerator or freezer to cool, stirring occasionally until partly thickened. 4. Beat egg white until stiff. Beat whipping cream until thickened. Set both aside. 5. In a very large bowl beat cream cheese, gradually adding remainder of sugar until smooth. 6. Beat in cooled gelatin juice mixture and lemon juice. 7. Fold whipped cream into cheese mixture, then fold in beaten egg white. If available, fold in a few fresh or thawed raspberries. 8. Pour into crust and spread to edges. Freeze until firm – at least 4 hours – or overnight. Keeps well for several weeks if covered with plastic wrap. Variation: Spoon unfrozen mixture into purchased chocolate cups, then freeze.